Javad Javadov, the lawyer for the head of the Muslim Union Movement Taleh Bagirzade has spoken out about his client’s arrest and subjection to torture. Taleh Bagirzade was arrested in a police operation in the Nardaran settlement of Baku on November 26, 2015. According to the Prosecutor General’s Office, 58 people have been arrested in connection with the Nardaran events. The Serious Crimes Investigation Department under the Prosecutor General’s Office has launched a criminal case, and those detained have been charged under articles 120 (deliberate homicide), 214 (terrorism), 220 (mass disorders), 228 (illegal acquisition, transfer, sale, storage, transportation or carrying of firearms, their accessories, ammunition and explosives), 233 (organization of actions promoting infringement of public order or active participation in such actions), 278 (violent seizure or maintenance of power), 283 (inciting national, racial, social or religious enmity) and 315 (resistance or violence against a representative of authority) of the Criminal Code. According to the Javadov, his client rejects the charges and does not consider himself guilty. “Upon his arrest, Taleh Bagirzade was taken to the Main Organized Crime Department (MOCD) of the Ministry of Internal Affairs. He was subjected to severe torture at the time of his arrest and while during his detention at the MOCD. I saw the evidence of the torture with my own eyes at the Appeal Court; his nose was broken. However, there has been no forensic or medical examination conducted in regard to the allegation,” said the lawyer. He went on to say that Taleh Bagirzade had not used a weapon against anyone, nor made appeals against the state, nor given any speeches aimed at changing the constitutional system of Azerbaijan. “Taleh Bagirzade was called to the Ministry of National Security in 2015, where they had a conversation with him. He went to the Ministry voluntarily. Later, he was called to the Yasamal District Police Office of Baku; he went there voluntarily, too. Taleh Bagirzade had repeatedly mentioned in his speeches that [the Union’s] activity was civil, peaceful, and in line with all relevant legal requirements. Had the state authorities summoned him when he was in Nardaran, he would also have complied with that summons. But I assume that his voluntary compliance did not sit well with some people. So, they carried out the police operation, which the defense believes that have quite a few suspicious aspects to it. We believe that Taleh Bagirzade was arrested because of his speeches, and this amounts to violation of the freedom of expression,” Javad Javadov said. “Taleh Bagirzade’s activity was transparent. All his speeches were posted on the Internet, and all of his public appeals were shared on his own page. We categorically reject these charges,” Javadov stressed. 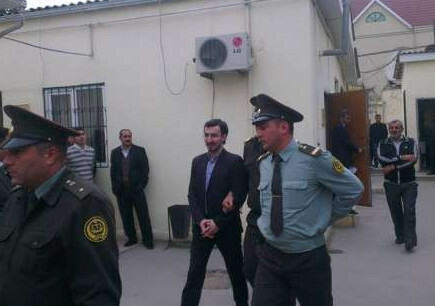 Taleh Bagirzade has been imprisoned twice previously. He was first arrested on May 6, 2011, for participating in a protest against the ban on wearing the hijab, held in front of the Ministry of Education. He was convicted under articles 221.2 (hooliganism, by a group of people) and 233 (organization of actions promoting infringement of public order or active participation in such actions) of the Criminal Code, and sentenced to 1.5 years in prison. Although he was release in November 2012 having served his sentence in full, he was arrested again in March 2013, this time charged with drug abuse. Bagirzade served a second jail sentence of 2 years and 4 months, before being released in July 2015.